Dust blows from the Sahara Desert over the Atlantic Ocean towards the Canary Islands. Sediment transport is the movement of solid particles (sediment), typically due to a combination of gravity acting on the sediment, and/or the movement of the fluid in which the sediment is entrained. Sediment transport occurs in natural systems where the particles are clastic rocks (sand, gravel, boulders, etc. ), mud, or clay; the fluid is air, water, or ice; and the force of gravity acts to move the particles along the sloping surface on which they are resting. Sediment transport due to fluid motion occurs in rivers, oceans, lakes, seas, and other bodies of water due to currents and tides. Transport is also caused by glaciers as they flow, and on terrestrial surfaces under the influence of wind. Sediment transport due only to gravity can occur on sloping surfaces in general, including hillslopes, scarps, cliffs, and the continental shelf—continental slope boundary. Sediment transport is important in the fields of sedimentary geology, geomorphology, civil engineering and environmental engineering (see applications, below). Knowledge of sediment transport is most often used to determine whether erosion or deposition will occur, the magnitude of this erosion or deposition, and the time and distance over which it will occur. Toklat River, East Fork, Polychrome overlook, Denali National Park, Alaska. This river, like other braided streams, rapidly changes the positions of its channels through processes of erosion, sediment transport, and deposition. Congo river viewed from Kinshasa, Democratic Republic of Congo. Its brownish color is mainly the result of the transported sediments taken upstream. Aeolian or eolian (depending on the parsing of æ) is the term for sediment transport by wind. This process results in the formation of ripples and sand dunes. Typically, the size of the transported sediment is fine sand (<1 mm) and smaller, because air is a fluid with low density and viscosity, and can therefore not exert very much shear on its bed. Bedforms are generated by aeolian sediment transport in the terrestrial near-surface environment. Ripples and dunes form as a natural self-organizing response to sediment transport. Aeolian sediment transport is common on beaches and in the arid regions of the world, because it is in these environments that vegetation does not prevent the presence and motion of fields of sand. Wind-blown very fine-grained dust is capable of entering the upper atmosphere and moving across the globe. Dust from the Sahara deposits on the Canary Islands and islands in the Caribbean, and dust from the Gobi desert has deposited on the western United States. This sediment is important to the soil budget and ecology of several islands. Deposits of fine-grained wind-blown glacial sediment are called loess. In geology, physical geography, and sediment transport, fluvial processes relate to flowing water in natural systems. This encompasses rivers, streams, periglacial flows, flash floods and glacial lake outburst floods. Sediment moved by water can be larger than sediment moved by air because water has both a higher density and viscosity. In typical rivers the largest carried sediment is of sand and gravel size, but larger floods can carry cobbles and even boulders. Fluvial sediment transport can result in the formation of ripples and dunes, in fractal-shaped patterns of erosion, in complex patterns of natural river systems, and in the development of floodplains. Sand ripples, Laysan Beach, Hawaii. Coastal sediment transport results in these evenly spaced ripples along the shore. Monk seal for scale. Coastal sediment transport takes place in near-shore environments due to the motions of waves and currents. At the mouths of rivers, coastal sediment and fluvial sediment transport processes mesh to create river deltas. Coastal sediment transport results in the formation of characteristic coastal landforms such as beaches, barrier islands, and capes. A glacier joining the Gorner Glacier, Zermatt, Switzerland. These glaciers transport sediment and leave behind lateral moraines. As glaciers move over their beds, they entrain and move material of all sizes. Glaciers can carry the largest sediment, and areas of glacial deposition often contain a large number of glacial erratics, many of which are several metres in diameter. Glaciers also pulverize rock into "glacial flour", which is so fine that it is often carried away by winds to create loess deposits thousands of kilometres afield. 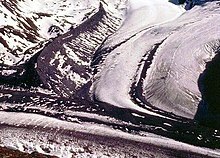 Sediment entrained in glaciers often moves approximately along the glacial flowlines, causing it to appear at the surface in the ablation zone. These processes generally combine to give the hillslope a profile that looks like a solution to the diffusion equation, where the diffusivity is a parameter that relates to the ease of sediment transport on the particular hillslope. For this reason, the tops of hills generally have a parabolic concave-up profile, which grades into a convex-up profile around valleys. As hillslopes steepen, however, they become more prone to episodic landslides and other mass wasting events. Therefore, hillslope processes are better described by a nonlinear diffusion equation in which classic diffusion dominates for shallow slopes and erosion rates go to infinity as the hillslope reaches a critical angle of repose. Large masses of material are moved in debris flows, hyperconcentrated mixtures of mud, clasts that range up to boulder-size, and water. Debris flows move as granular flows down steep mountain valleys and washes. Because they transport sediment as a granular mixture, their transport mechanisms and capacities scale differently from those of fluvial systems. Suspended sediment from a stream emptying into a fjord (Isfjorden, Svalbard, Norway). Sediment transport is applied to solve many environmental, geotechnical, and geological problems. Measuring or quantifying sediment transport or erosion is therefore important for coastal engineering. Several sediment erosion devices have been designed in order to quantitfy sediment erosion (e.g., Particle Erosion Simulator (PES)). One such device, also referred to as the BEAST (Benthic Environmental Assessment Sediment Tool) has been calibrated in order to quantify rates of sediment erosion. Movement of sediment is important in providing habitat for fish and other organisms in rivers. Therefore, managers of highly regulated rivers, which are often sediment-starved due to dams, are often advised to stage short floods to refresh the bed material and rebuild bars. This is also important, for example, in the Grand Canyon of the Colorado River, to rebuild shoreline habitats also used as campsites. Sediment discharge into a reservoir formed by a dam forms a reservoir delta. This delta will fill the basin, and eventually, either the reservoir will need to be dredged or the dam will need to be removed. Knowledge of sediment transport can be used to properly plan to extend the life of a dam. Geologists can use inverse solutions of transport relationships to understand flow depth, velocity, and direction, from sedimentary rocks and young deposits of alluvial materials. Flow in culverts, over dams, and around bridge piers can cause erosion of the bed. This erosion can damage the environment and expose or unsettle the foundations of the structure. Therefore, good knowledge of the mechanics of sediment transport in a built environment are important for civil and hydraulic engineers. When suspended sediment transport is increased due to human activities, causing environmental problems including the filling of channels, it is called siltation after the grain-size fraction dominating the process. The equations included here describe sediment transport for clastic, or granular sediment. They do not work for clays and muds because these types of floccular sediments do not fit the geometric simplifications in these equations, and also interact thorough electrostatic forces. The equations were also designed for fluvial sediment transport of particles carried along in a liquid flow, such as that in a river, canal, or other open channel. Only one size of particle is considered in this equation. However, river beds are often formed by a mixture of sediment of various sizes. In case of partial motion where only a part of the sediment mixture moves, the river bed becomes enriched in large gravel as the smaller sediments are washed away. The smaller sediments present under this layer of large gravel have a lower possibility of movement and total sediment transport decreases. This is called armouring effect. Other forms of armouring of sediment or decreasing rates of sediment erosion can be caused by carpets of microbial mats, under conditions of high organic loading. as a function of a specific form of the particle Reynolds number called the boundary Reynolds number. The mathematical solution of the equation was given by Dey. , which is a way of rewriting shear stress in terms of velocity.
. There are several ways to solve for the bed shear stress. First, we develop the simplest approach, in which the flow is assumed to be steady and uniform and reach-averaged depth and slope are used. Due to the difficulty of measuring shear stress in situ, this method is also one of the most-commonly used. This method is known as the depth-slope product. For all flows that cannot be simplified as a single-slope infinite channel (as in the depth-slope product, above), the bed shear stress can be locally found by applying the Saint-Venant equations for continuity, which consider accelerations within the flow. is a function of boundary Reynolds number, a specific type of particle Reynolds number. will be an emprical constant given by the Shields Curve or by another set of empirical data (depending on whether or not the grain size is uniform). We make several assumptions to provide an example that will allow us to bring the above form of the equation into a solved form. where R is the submerged specific gravity of the sediment. and insert both values at the end. This final expression shows that the product of the channel depth and slope is equal to the Shield's criterion times the submerged specific gravity of the particles times the particle diameter. , the submerged specific gravity is equal to 1.65. For these situations, the product of the depth and slope of the flow should be 10% of the diameter of the median grain diameter. Which means that the depth times the slope should be about 5% of the median grain diameter in the case of a mixed-grain-size bed. The sediments entrained in a flow can be transported along the bed as bed load in the form of sliding and rolling grains, or in suspension as suspended load advected by the main flow. Some sediment materials may also come from the upstream reaches and be carried downstream in the form of wash load. The location in the flow in which a particle is entrained is determined by the Rouse number, which is determined by the density ρs and diameter d of the sediment particle, and the density ρ and kinematic viscosity ν of the fluid, determine in which part of the flow the sediment particle will be carried. Here, the Rouse number is given by P. The term in the numerator is the (downwards) sediment the sediment settling velocity ws, which is discussed below. The upwards velocity on the grain is given as a product of the von Kármán constant, κ = 0.4, and the shear velocity, u∗. The following table gives the approximate required Rouse numbers for transport as bed load, suspended load, and wash load. Streamlines around a sphere falling through a fluid. This illustration is accurate for laminar flow, in which the particle Reynolds number is small. This is typical for small particles falling through a viscous fluid; larger particles would result in the creation of a turbulent wake. is the kinematic viscosity of water, which is approximately 1.0 x 10−6 m2/s for water at 20 °C. are constants related to the shape and smoothness of the grains. 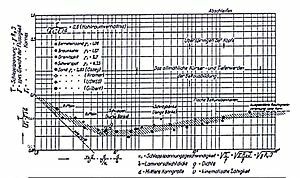 In 1935, Filip Hjulström created the Hjulström curve, a graph which shows the relationship between the size of sediment and the velocity required to erode (lift it), transport it, or deposit it. The graph is logarithmic. Åke Sundborg later modified the Hjulström curve to show separate curves for the movement threshold corresponding to several water depths, as is necessary if the flow velocity rather than the boundary shear stress (as in the Shields diagram) is used for the flow strength. This curve has no more than a historical value nowadays, although its simplicity is still attractive. Among the drawbacks of this curve are that it does not take the water depth into account and more importantly, that it does not show that sedimentation is caused by flow velocity deceleration and erosion is caused by flow acceleration. The dimensionless Shields diagram is now unanimously accepted for initiation of sediment motion in rivers. A schematic diagram of where the different types of sediment load are carried in the flow. Dissolved load is not sediment: it is composed of disassociated ions moving along with the flow. It may, however, constitute a significant proportion (often several percent, but occasionally greater than half) of the total amount of material being transported by the stream. Formulas to calculate sediment transport rate exist for sediment moving in several different parts of the flow. These formulas are often segregated into bed load, suspended load, and wash load. They may sometimes also be segregated into bed material load and wash load. Bed load moves by rolling, sliding, and hopping (or saltating) over the bed, and moves at a small fraction of the fluid flow velocity. Bed load is generally thought to constitute 5-10% of the total sediment load in a stream, making it less important in terms of mass balance. However, the bed material load (the bed load plus the portion of the suspended load which comprises material derived from the bed) is often dominated by bed load, especially in gravel-bed rivers. This bed material load is the only part of the sediment load that actively interacts with the bed. As the bed load is an important component of that, it plays a major role in controlling the morphology of the channel. Bed load transport rates are usually expressed as being related to excess dimensionless shear stress raised to some power. Excess dimensionless shear stress is a nondimensional measure of bed shear stress about the threshold for motion. and is an important in that it shows bed shear stress as a multiple of the value of the criterion for the initiation of motion. When used for sediment transport formulae, this ratio is typically raised to a power. Due to the difficulty of estimating bed load transport rates, these equations are typically only suitable for the situations for which they were designed. is 0.047, and is the third commonly used value for this (in addition to Parker's 0.03 and Shields' 0.06). In 2003, Peter Wilcock and Joanna Crowe (now Joanna Curran) published a sediment transport formula that works with multiple grain sizes across the sand and gravel range. Their formula works with surface grain size distributions, as opposed to older models which use subsurface grain size distributions (and thereby implicitly infer a surface grain sorting). Their expression is more complicated than the basic sediment transport rules (such as that of Meyer-Peter and Müller) because it takes into account multiple grain sizes: this requires consideration of reference shear stresses for each grain size, the fraction of the total sediment supply that falls into each grain size class, and a "hiding function". The "hiding function" takes into account the fact that, while small grains are inherently more mobile than large grains, on a mixed-grain-size bed, they may be trapped in deep pockets between large grains. Likewise, a large grain on a bed of small particles will be stuck in a much smaller pocket than if it were on a bed of grains of the same size. In gravel-bed rivers, this can cause "equal mobility", in which small grains can move just as easily as large ones. As sand is added to the system, it moves away from the "equal mobility" portion of the hiding function to one in which grain size again matters. that is present on the bed. include the relative size effects producing ‘‘hiding’’ of fine grains and ‘‘exposure’’ of coarse grains. The ‘‘hiding’’ effect takes into account the fact that, while small grains are inherently more mobile than large grains, on a mixed-grain-size bed, they may be trapped in deep pockets between large grains. Likewise, a large grain on a bed of small particles will be stuck in a much smaller pocket than if it were on a bed of grains of the same size, which the Meyer-Peter and Müller formula refers to. In gravel-bed rivers, this can cause ‘‘equal mobility", in which small grains can move just as easily as large ones. As sand is added to the system, it moves away from the ‘‘equal mobility’’ portion of the hiding function to one in which grain size again matters. represents either the sand (s) or gravel (g) fraction . The critical shear stress that represents the incipient motion for each of the two fractions is consistent with established values in the limit of pure sand and gravel beds and shows a sharp change with increasing sand content over the transition from a clast- to matrix-supported bed. is the critical shear stress for incipient motion of the sand fraction, which was calculated graphically using the updated Shields-type relation of Miller et al.(1977). Suspended load is carried in the lower to middle parts of the flow, and moves at a large fraction of the mean flow velocity in the stream. to the eddy diffusivity for sediment, which is approximately equal to one. ranges from 0.93 to 1.10 for sands and silts. The Rouse profile characterizes sediment concentrations because the Rouse number includes both turbulent mixing and settling under the weight of the particles. Turbulent mixing results in the net motion of particles from regions of high concentrations to low concentrations. Because particles settle downward, for all cases where the particles are not neutrally buoyant or sufficiently light that this settling velocity is negligible, there is a net negative concentration gradient as one goes upward in the flow. The Rouse Profile therefore gives the concentration profile that provides a balance between turbulent mixing (net upwards) of sediment and the downwards settling velocity of each particle. Bed material load comprises the bed load and the portion of the suspended load that is sourced from the bed. Three common bed material transport relations are the "Ackers-White", "Engelund-Hansen", "Yang" formulae. The first is for sand to granule-size gravel, and the second and third are for sand though Yang later expanded his formula to include fine gravel. That all of these formulae cover the sand-size range and two of them are exclusively for sand is that the sediment in sand-bed rivers is commonly moved simultaneously as bed and suspended load. is the Shields stress. The Engelund-Hansen formula is one of the few sediment transport formulae in which a threshold "critical shear stress" is absent. Wash load is carried within the water column as part of the flow, and therefore moves with the mean velocity of main stream. Wash load concentrations are approximately uniform in the water column. This is described by the endmember case in which the Rouse number is equal to 0 (i.e. the settling velocity is far less than the turbulent mixing velocity), which leads to a prediction of a perfectly uniform vertical concentration profile of material. Some authors have attempted formulations for the total sediment load carried in water. These formulas are designed largely for sand, as (depending on flow conditions) sand often can be carried as both bed load and suspended load in the same stream or shoreface. ^ Anderson, R (1990). "Eolian ripples as examples of self-organization in geomorphological systems". Earth-Science Reviews. 29: 77. doi:10.1016/0012-8252(0)90029-U. ^ Kocurek, Gary; Ewing, Ryan C. (2005). "Aeolian dune field self-organization – implications for the formation of simple versus complex dune-field patterns". Geomorphology. 72: 94. Bibcode:2005Geomo..72...94K. doi:10.1016/j.geomorph.2005.05.005. ^ Goudie, A; Middleton, N.J. (2001). "Saharan dust storms: nature and consequences". Earth-Science Reviews. 56: 179. Bibcode:2001ESRv...56..179G. doi:10.1016/S0012-8252(01)00067-8. ^ Ashton, Andrew; Murray, A. Brad; Arnault, Olivier (2001). "Formation of coastline features by large-scale instabilities induced by high-angle waves". Nature. 414 (6861): 296–300. Bibcode:2001Natur.414..296A. doi:10.1038/35104541. PMID 11713526. ^ Roering, Joshua J.; Kirchner, James W.; Dietrich, William E. (1999). "Evidence for nonlinear, diffusive sediment transport on hillslopes and implications for landscape morphology". Water Resources Research. 35 (3): 853. Bibcode:1999WRR....35..853R. doi:10.1029/1998WR900090. ^ Dey S. (1999) Sediment threshold. Applied Mathematical Modelling, Elsevier, Vol. 23, No. 5, 399-417. ^ a b Hubert Chanson (2004). The Hydraulics of Open Channel Flow: An Introduction. Butterworth-Heinemann, 2nd edition, Oxford, UK, 630 pages. ISBN 978-0-7506-5978-9. ^ Whipple, Kelin (2004). "Hydraulic Roughness" (PDF). 12.163: Surface processes and landscape evolution. MIT OCW. Retrieved 2009-03-27. ^ a b Parker, G., 1990. Surface-based bedload transport relation for gravel rivers. Journal of hydraulic research, 28(4), pp.417-436. ^ a b c d e f g h Whipple, Kelin (September 2004). "IV. Essentials of Sediment Transport" (PDF). 12.163/12.463 Surface Processes and Landscape Evolution: Course Notes. MIT OpenCourseWare. Retrieved 2009-10-11. ^ Moore, Andrew. "Lecture 20—Some Loose Ends" (PDF). Lecture Notes: Fluvial Sediment Transport. Kent State. Retrieved 23 December 2009. ^ Dietrich, W. E. (1982). "Settling Velocity of Natural Particles" (PDF). Water Resources Research. 18 (6): 1615–1626. Bibcode:1982WRR....18.1615D. doi:10.1029/WR018i006p01615. ^ The long profile – changing processes: types of erosion, transportation and deposition, types of load; the Hjulstrom curve. coolgeography.co.uk. Last accessed 26 Dec 2011. ^ Special Topics: An Introduction to Fluid Motions, Sediment Transport, and Current-generated Sedimentary Structures; As taught in: Fall 2006. Massachusetts Institute of Technology. 2006. Last accessed 26 Dec 2011. ^ Meyer-Peter, E; Müller, R. (1948). Formulas for bed-load transport. Proceedings of the 2nd Meeting of the International Association for Hydraulic Structures Research. pp. 39–64. ^ a b Fernandez-Luque, R; van Beek, R (1976). "Erosion and transport of bedload sediment". Jour. Hyd. Research. 14 (2). ^ a b Cheng, Nian-Sheng (2002). "Exponential Formula for Bedload Transport". Journal of Hydraulic Engineering. 128 (10): 942. doi:10.1061/(ASCE)0733-9429(2002)128:10(942). ^ a b Wilson, K. C. (1966). "Bed-load transport at high shear stress". J. Hydraul. Div. ASCE. 92 (6): 49–59. ^ a b Wiberg, Patricia L.; Dungan Smith, J. (1989). "Model for Calculating Bed Load Transport of Sediment". Journal of Hydraulic Engineering. 115: 101. doi:10.1061/(ASCE)0733-9429(1989)115:1(101). ^ a b c Wilcock, Peter R.; Crowe, Joanna C. (2003). "Surface-based Transport Model for Mixed-Size Sediment". Journal of Hydraulic Engineering. 129 (2): 120. doi:10.1061/(ASCE)0733-9429(2003)129:2(120). ^ a b Parker, G.; Klingeman, P. C.; McLean, D. G. (1982). "Bedload and Size Distribution in Paved Gravel-Bed Streams". Journal of the Hydraulics Division. ASCE. 108 (4): 544–571. ^ Wilcock, P. R. (1998). "Two-fraction model of initial sediment motion in gravel-bed rivers". Science (280): 410–412. Bibcode:1998Sci...280..410W. doi:10.1126/science.280.5362.410. ^ a b c d e Wilcock, Peter R.; Kenworthy, T. (2002). "A two-fraction model for the transport of sand/gravel mixtures". Water Resour. Res. 38 (10): 1194. Bibcode:2002WRR....38.1194W. doi:10.1029/2001WR000684. ^ a b c d e Kuhnle, R. A.; Wren, D. G.; Langendoen, E. J.; Rigby, J. R. (2013). "Sand Transport over an Immobile Gravel Substrate". Journal of Hydraulic Engineering. 139 (2). doi:10.1061/(ASCE)HY.1943-7900.0000615. ^ a b Pellachini, Corrado (2011). Modelling fine sediment transport over an immobile gravel bed. Trento: Unitn-eprints. ^ Nikora, V; Goring, D; McEwan, I; Griffiths, G (2001). "Spatially averaged open-channel flow over rough bed". J. Hydraul. Eng. 127 (2). doi:10.1061/(ASCE)0733-9429(2001)127:2(123). ^ Miller, M.C. ; McCave, I.N. ; Komar, P.D. (1977). "Threshold of sediment motion under unidirectional currents". Sedimentology. 24 (4): 507–527. Bibcode:1977Sedim..24..507M. doi:10.1111/j.1365-3091.1977.tb00136.x. ^ Harris, Courtney K. (March 18, 2003). "Lecture 9: Suspended Sediment Transport II" (PDF). Sediment transport processes in coastal environments. Virginia Institute of Marine Science. Archived from the original (PDF) on 28 May 2010. Retrieved 23 December 2009. ^ Moore, Andrew. "Lecture 21—Suspended Sediment Transport" (PDF). Lecture Notes: Fluvial Sediment Transport. Kent State. Retrieved 25 December 2009. ^ Ackers, P.; White, W.R. (1973). "Sediment Transport: New Approach and Analysis". Journal of the Hydraulics Division. ASCE. 99 (11): 2041–2060. ^ Ariffin, J.; A.A. Ghani; N.A. Zakaira; A.H. Yahya (14–16 October 2002). "Evaluation of equations on total bed material load" (PDF). International Conference on Urban Hydrology for the 21st Century. Kuala Lumpur. ^ Yang, C (1979). "Unit stream power equations for total load". Journal of Hydrology. 40: 123. Bibcode:1979JHyd...40..123Y. doi:10.1016/0022-1694(79)90092-1. ^ Bailard, James A. (1981). "An Energetics Total Load Sediment Transport Model For a Plane Sloping Beach". Journal of Geophysical Research. 86: 10938. Bibcode:1981JGR....8610938B. doi:10.1029/JC086iC11p10938. Liu, Z. (2001), Sediment Transport. Moore, A. Fluvial sediment transport lecture notes, Kent State. Linwood, J,G Suspended Sediment Concentration and Discharge in a West London River.